St. Lazarus Island is located in the lagoon of Venice. Because of its isolated location it was used as leper colony in the 12th century. In 1717 it was given to some Armenian monks. Today the whole island is covered by their monastery. 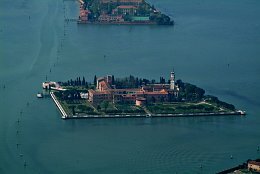 San Servolo is located in the lagoon of Venice. From the 8th to the 12th century the island was used as monastery, later it became a hospital for mental illness. Today it is used for exhibitions and conferences.